Kombucha tea is fermented black or green tea and sugar, partnered with a culture of bacteria and yeast. 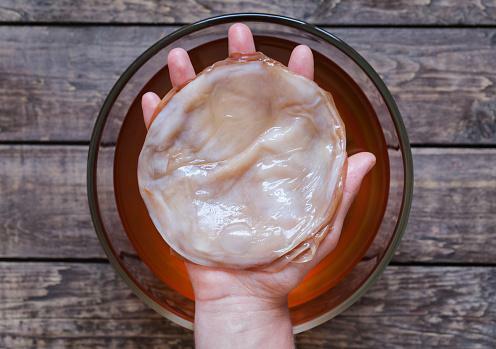 Contrary to popular belief, kombucha is not a mushroom, but when the bacterial culture and yeast blend with prepared sweet tea, a membrane resembling a mushroom forms at the surface. While there may be health benefits for some, kombucha is probably not the best beverage to serve to children. Any benefits to adults may also be available to children drinking kombucha tea. Proponents claim it helps improve digestion, prevents cancer, boosts your immune system, and improves liver function. More research (human trials) is needed to determine if this is indeed the case, but Mayo Clinic says evidence doesn't back such health claims. Colorado State University says kombucha tea is a good source of antioxidants, which may help prevent (or delay) cell damage. A 2014 review published in the Journal of Medicinal Food reports kombucha tea may detoxify and energize the body and work as an antioxidant. Antioxidants are classified as healthy when consumed as part of a diet rich in fruits and veggies, but the National Center for Complementary and Alternative Medicine says consuming antioxidants in supplement form doesn't appear to be beneficial for disease prevention. In addition to being a source of antioxidants, Colorado State University says kombucha tea is rich in essential B vitamins, which play roles in metabolism and red blood cell formation. Likewise, this type of tea is fairly low in calories, containing just 30 calories per cup (much lower in calories than many sugary drinks like soda). Therefore, kombucha tea may play a role in healthy weight management when consumed in place of soda and other sugary drinks so many kids consume. Because bacterial cultures are used to ferment kombucha tea, probiotics are useful for gastrointestinal health. Probiotics can reduce the severity or duration of diarrhea, says Harvard Health Publications , and probiotics may be useful for preventing female urogenital problems like yeast and urinary tract infections. However, even with potential health benefits, there are many risks when it comes to children drinking kombucha tea, and some may be serious. Kombucha mushroom is associated with liver damage, says the University of Maryland Medical Center. Sunrise Children's Hospital says some people have reported jaundice and liver inflammation after regularly drinking the tea. A 2009 study published in the Journal of Intensive Care Medicine links reported liver problems with drinking kombucha tea. So use caution and avoid regular use of kombucha tea -- especially among children. Other unpleasant side effects may occur after drinking kombucha tea, reports Sunrise Children's Hospital. These include nausea, shortness of breath, tightness in the throat, headache, and dizziness. 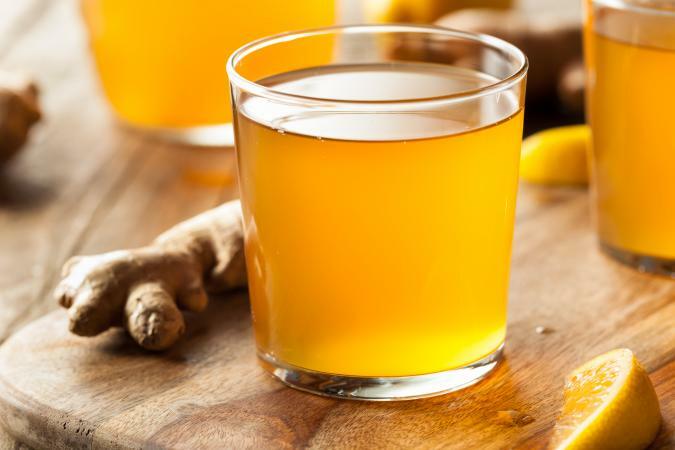 Mayo Clinic says reports of upset stomach, allergic reactions, and infections have also occurred in people--including children--drinking kombucha tea. Liver damage is a serious health problem related to kombucha tea, and other life threatening conditions may occur. The 2009 study published in the Journal of Intensive Care Medicine says several people reported life-threatening lactic acidosis (excessive lactic acid buildup in the body) after drinking kombucha tea. 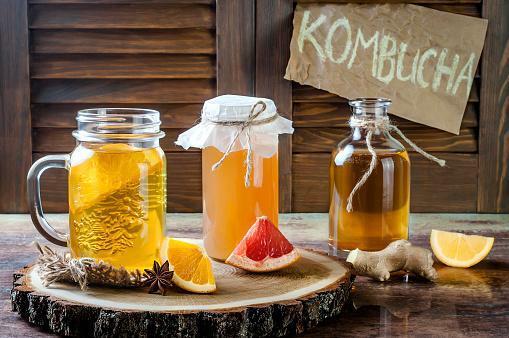 Researchers who conducted the study discourage drinking kombucha tea because of this. Likewise, Sunrise Children's Hospital says there are reports of unconsciousness related to kombucha tea. Lead poisoning could occur from (regularly) drinking kombucha tea brewed in ceramic pots. Mayo Clinic says this happens because acids in kombucha tea can leach the lead from ceramic glazes. Lead poisoning may be especially problematic for children because long-term exposure in small bodies can cause serious health issues. However, if the tea isn't brewed in ceramic pots, lead poisoning likely isn't a concern (unless brewed with water containing high lead levels). Should Children Drink Kombucha Tea? Because of potential health risks, children shouldn't drink kombucha tea unless their doctor okays it. Because some risks (even if they are rare) can be serious, they outweigh any potential health benefits for children, and whether health benefits exist requires additional research (human trials). Kids can get daily doses of antioxidants, probiotics, and other vitamins and minerals by eating well-balanced diets containing a variety of fruits, vegetables, yogurt, whole grains, and other nutritious foods.